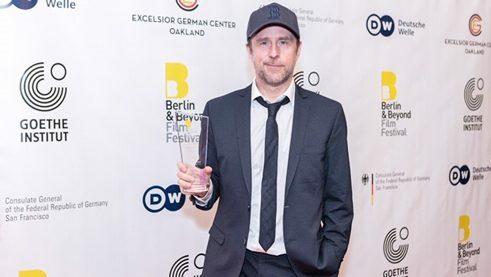 At its opening, the 23rd Berlin & Beyond Film Festival, held in San Francisco from 8-14 March, is showing the film 25 km/h starring Bjarne Mädel and Lars Eidinger. 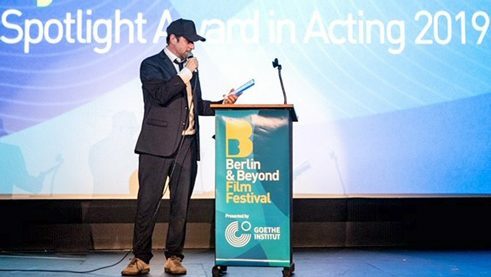 In a conversation with “The Latest” at Goethe, this year’s recipient of the Spotlight Award in Acting Bjarne Mädel tells us what’s behind his acting career. Welcome to San Francisco, Bjarne Mädel! You lived in California for two years after graduating high school. What did you do here? My grandma’s cousin emigrated in the early 1960s and moved to Palm Springs with all her relatives. I was there for the first time at 15 and thought it was great. So after graduation, I went there for a longer period of time, also to see if I could live there. My family in Palm Springs was my first point of contact and I worked for their painting company, on real construction sites. Until my father said to me, “Don’t you want to learn something?” So I enrolled at the University of Redlands to study world literature and creative writing. It was a great time; I lived on campus, played soccer, worked in radio and sang in the chorus. Unfortunately, I had to break off my time in America then. So after two years, I returned to Germany. Did you visit San Francisco back then? Yes, first with the family, but later, too, many times. My sister lives in Oregon, and San Francisco is about halfway between Palm Springs and Oregon. I really like the city. That’s why I didn’t have to think twice when I got the invitation from the Goethe-Institut. You studied drama and literature then spent a long time at the Volkstheater Rostock and Schauspielhaus Hamburg before your television career launched with Stromberg. Do you sometimes miss the stage? I still perform regularly as a guest actor in the theatre; the Schauspielhaus Hamburg is my artistic home. It’s a remarkable and lively place with a lot of history – like the Castro Theater here in San Francisco. Because of all the film work I’ve done, I no longer have a permanent engagement at a theatre and sometimes I miss that, but I also enjoy the freedom to choose what I do. I’d rather shoot a great movie than act in a bad play. And in recent years I’ve been lucky enough to be able to work on very exciting film projects. I never really wanted to be on camera; I have classical theatre training and acted in theatre for ten years. Back then, I might’ve done some film work now and then to pay off my student debt, but I didn’t want to be a movie actor. I found it boring in part because the language is so commonplace. I liked the different, sometimes rather bulky language of the theatre. Then I stepped in front of the camera for the Stromberg series and realised that it was a lot of fun, too. When you’re shooting, the camera’s often right in your face so you can work very subtly and minimalistic. That’s different in the theatre. It’s more about impact, how the actor feels isn’t important. He has to make the others cry, but he doesn’t have to be sad himself. That doesn’t work in film; the camera sees what you feel. You have to work more from the inside, to feel the material authentically in a way. That’s a challenge. You became very well known with the multi-award-wining TV series Stromberg, and then continued working in comedy series like Der kleine Mann, Mord mit Aussicht and Crime Scene Cleaner. On the other hand, you play a very serious role in the abortion drama 24 Weeks. What’s more challenging for you to play: serious or funny characters? It’s not such a big difference to me. The biggest difference in terms of the craft is that timing in comedy is much more precise. When it comes to making the audience cry, it doesn’t really matter when – the main thing is that it happens sometime in the scene. Of course, the music, the story, the camera setting helps. But comedy just isn’t funny if you miss the timing. A joke works when it’s well timed. That’s why comedy is often a lot more difficult. People always think we’re laughing on Crime Scene Cleaner, but there’s no time for that because we’re so focused on the work. People always ask us how much is improvised in Crime Scene Cleaner or Stromberg. The answer is that hardly anything is improvised; every slip of the tongue is in the script. Bjarne Mädel accepting his award | Photo: Barak Shrama In the successful road movie 25 km/h, Lars Eidinger and you play very different brothers, who reunite after the death of their father and fulfil a childhood dream: a cross-country moped trip. Our film festival Berlin & Beyond is showing the international premiere of 25 km/h as the opening film. What do you think, how does the American public like this crazy journey by the odd couple brothers? The feeling of having missed out on something is universal, just like the yearning to make up for it. Everyone feels that. So I believe that the film can touch hearts here as well. And the humour went across very well at the premiere, too. One nice side effect is that they get a presentation of Germany – from the Black Forest to the Baltic Sea – and how different and beautiful these landscapes are. The cinematographer Frank Griebe just has an awesome eye. I think the images touch your emotions; some images are like paintings. The music is great, too; the songs take you back there. Can you reveal what your next project is? Last week I finished shooting a movie in Hamburg called Tage des letzten Schnees based on a novel by Jan Costin Wagner. It’s a drama, so again a very serious role. Another big project coming up is my directorial debut in which I also play the lead. It’s so exciting for me because I’m now responsible for everything. That’s more than ever before and I’m really looking forward to it. George Tabori has said, “You have to work dangerously,” so even with the risk of failure. The interview was conducted by Sigrid Savelsberg, director of the Goethe-Institut in San Francisco.